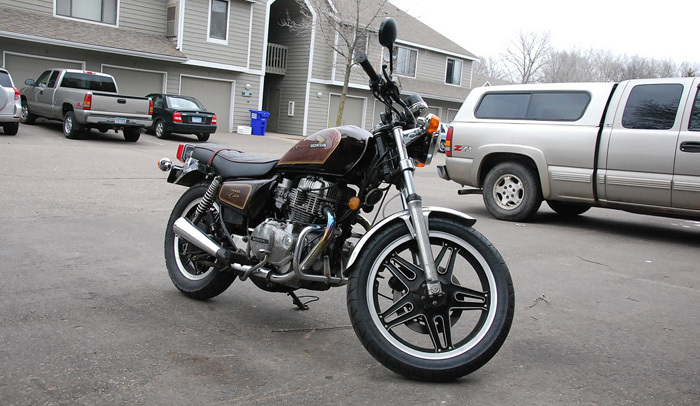 April 9, 2011 — I posted a few weeks ago about finally getting my wife’s ’81 Honda CM400 Custom sorted out after lots of carburetor frustrations and a blown head gasket. Jeff and I got the bike in good mechanical nick and softly customized, but it was still the tail end of winter, so I hadn’t had an opportunity to actually ride the bike in its new condition. With a new old motorcycle in our stable (my GL), it was time to swap one old bike for another down at Bluecat Motors. What followed was one of the more surreal riding experience of my motorcycle career so far. The task fell to me to retrieve the CM400 because The Mrs hadn’t been out on two wheels yet this season. That, and this bike hadn’t been ridden since being pulled apart in significant ways. I wasn’t about to turn her (my most important customer) loose on an unproven motorcycle. So with a couple random rain drops falling from the sky, I prepped the bike for departure at Bluecat Motors. Prep is important, people. The front tire didn’t have any measurable air pressure. The front suspension also needed air, as it was a bit spongy. I reconnected the fuel line and opened the petcock to fill the bowls for the first time since the rebuild. With the bike set on its side stand I fired it up. As happened months ago, Jeff noticed right away that the bike was only running on one cylinder and I didn’t have a clue. He pulled the right plug wire and nothing changed. He pulled the left and it died. It was a simple fix though. All that was needed was to set the bike upright on its center stand so that fuel could flow into the right hand carb bowl. With that sorted, the bike ran like a champ and idled off choke immediately. I powered off, pausing to let a short spell of rain pass over. I turned off the petcock and let the CM sit. Within a few minutes, the skies brightened and I set off, The Mrs in tow in her car. The CM ran brilliantly. What had been a rough, temperamental yet kinda fun motorcycle was now a revelation. The fresh engine and clean carbs pulled hard, the gearbox was tight and precise, and the new stainless brake line up front had the CM stopping on a dime. It was brilliant, but only for a moment. I got about four blocks away before the CM started to hesitate and lose power. My heart sank thinking that after all that work something was wrong in the carbs. The bike finally stalled completely and wouldn’t restart, no matter how much choke I gave it. Looking at the controls and trying desperately to figure out what was wrong, it finally dawned on me. I hadn’t turned the fuel back on. Duh! With a quick twist of the petcock and just a touch of gravity, I was able to get the bike going again. Fuel is important kids. Remember that. Mad at myself, I tore down Marshal toward the Mississippi. I wasn’t mad for long, because this little japanese bike was entirely too much fun. The CM was so tight, so brilliant, I just couldn’t help but giggle as the raspy little twin snarled down the street with me on it. I came up behind some slower traffic, went down a gear and screwed it on, shooting around the cars in my way. Turning onto the eastern river parkway, I opened up the CM again. I adore the way a small parallel twin like this pulls away from a dead stop. I couldn’t go too fast, since the speed limit on the parkway is all of 25 mph, but winding my way along the river through sleepy St. Paul neighborhoods, I fell head over handlebars in love with that little bike. It’s so easy to ride, so basic, so precise and just such a perfect little motorcycle for the city. I was soon confronted with a profound realization. I wanted this bike. That is, I wanted a bike like this one, and I’d sell my Vespa to have one if I had to. I eventually pulled out onto Hwy 55 to get across the river and down into Eagan. At highway speed, the CM pulled great and soaked up road bumps admirably considering its stock suspension. What I loved most though, was the feeling of purity I got from the bike. This was that true cafe racer vibe — that feeling you get from taking something ordinary and making it perform better and punch above its weight. The low bars and new seating position only added to that sense of speed — like I was riding back in time. The CM still spoke Japanese, but it did it with a heavy british accent now. It felt like I was channeling all those rocker chaps in their frankenstein race machines from the ’60s. My favorite bit? That 60 mph on that bike feels like you’re doing a hundred. There’s a purity to that experience, and now I want a little Honda cafe of my very own. It was also fun to think that I’m riding a cafe bike from the internet! Arriving at home, the plan was for me to hop on my Vespa and The Mrs to take the CM out for her first ride on her bike since it blew up last year. She got her gear on and was seated on the now running bike, ready to go. She was just about to kick up the side stand and start backing up. I gave the throttle a quick twist to unload the plugs and the grip went limp. The pull cable had pulled out of its anchor on the carb end. The timing was downright mean. She’d been waiting so long to ride this bike and just before she could, it was broken again. In the end, it only took about 15 minutes to re-solder the connector, but it’d be the next day before we finally got to take that ride. The verdict? She’s in love too. Now I want a brilliant little Honda cafe of my own. As I don’t think I’ll be able to steal this CM from her, I’ve got my eye on a Honda CB450 DOHC down at Bluecat that’s got a screwed up top end. It will be mine! Why do I always lust for the motorcycle you’ve just ridden? !